I love the new Elegant Mums Background. I think it has so much potential for coloring. I hope you saw the post this week for the Blog Hop, where I showed one way to use this stamp, along with so many other of the April Releases. There is a little story about the image above. Every time I make a new stamp, I ink the first image that comes out of the rubber stamp "oven" vulcanizer). 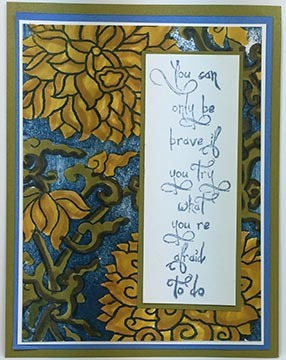 When I made the April stamps, I used a Denim Blue Distress Ink pad, because it was close at hand and convenient. I stamped all the images, set aside the paper (VERY satisfied with the results), and kept "ccoking." Just a day or so ago, I came across that sheet and decided to use some of those initial images. The image above was one of them - the first image from the first stamp off the line. All I did to finish this image was to color it with Distress Markers. Its very easy to color -- and I can't wait to use it with other color schemes! The sentiment is an older image called Afraid to Do. Remember that the April Release Stamps are on sale through Friday, April8th. Get yours today! Last Stop on the Technique Junkies April Blog Hop! Welcome! 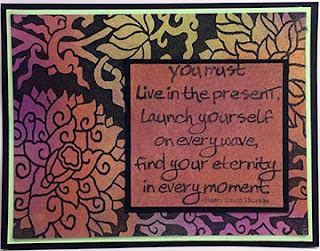 If you arrived here from Robin's Blog for the Technique Junkies Release Day Blog Hop, you are in the right place! If you started here, I urge you to stop and go back to the beginning of the hop, to the Design Team Blog so that you don't miss anything! Again, today is release day at Technique Junkies and we are celebrating the new stamps with new artwork from the design team! Also, the April Release Stamps are 15% off now through April 8th, too. Before you go shop, here are a few more pieces of artwork to inspire you. 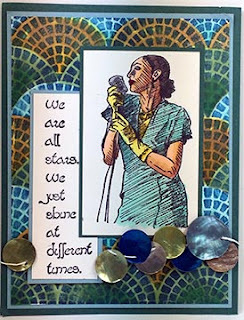 First up is the new Jazz Singer stamp layered over the new Mosaic Scallops background. I colored each of the images with Copic Markers. The sentiment is from the TJ line, and is called All Stars. The second piece here uses the new Bulls Eye Blooms Background under the new Bear with Flowers image. 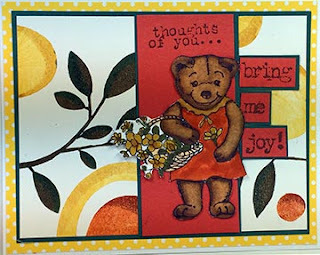 I used the existing Sentimental Sayings set to add a final touch to this card. The floral above uses the Elegant Mums background, with the existing Live in the Present stamp as a sentiment, The background for the mums was simply sprayed with Art Anthology Colorations. 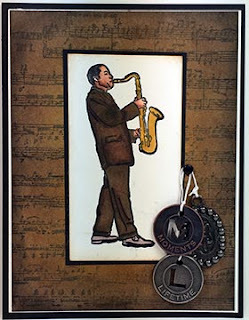 Finally, the Saxophonist stamp was the perfect image to use with the Palettini Vintage Music background. I hope you have been inspired today by today's hop. Make sure to stop by the store to get your 15% off the new April Releases! All content, including text, photographs and concept design work are © Patricia Huntoon. Content within this blog is shared for personal/non-commercial use and inspiration only unless asked for permission to use elsewhere. Thank you!